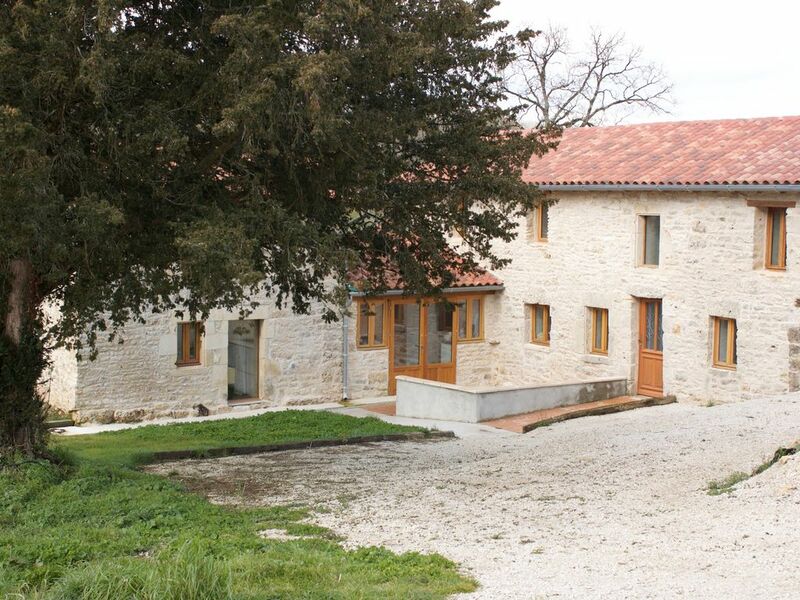 Detached house made from two restored 17th century stone barns. The half-metre thick walls help to keep you cool in summer, while modern electric heating makes this complex comfortable for the winter. Large, well equipped modern kitchen, separate dining room and huge (50 m2) terrace overlooking an entirely rural setting, with no other property overlooking the back garden or terrace. The surrounding landscape is covered in sunflowers, wheat and corn during the summer months. Chestnut trees are the other predominant crop, used mainly for locally manufactured parquet flooring. 4 double bedrooms (one with large sofa bed and one with two single beds). 3.5 bathrooms, one en suite with full wheel chair access. UK Satellite TV. Basic Wifi internet connection can be arranged. Lots of off street parking. Gentle hills and minimal traffic make this an excellent venue for walking and biking. There is lots of wildlife (deer, the occasional wild boar etc.) and an exciting bird population, both resident (including herons, all sorts of hawks and the odd hoopoe) and transitory. In the autumn, you can enjoy watching vast formations of whooping geese travel south, and in spring, cranes travel north. We are on a major migration route, and 100 km from one of Europe’s most famous bird sanctuaries, the Marais Poitevin. The national bird society regularly tag birds in our valley. The closest train station is 20 mins away (Ruffec) and offers several daily local train connections to Angoulême/Poitiers, where further connections by TGV are available to Paris/Bordeaux. You need a car in Les Augers, but friends and family can easily join the party by train or plane (Poitiers and Limoges airports each approx. 1 hr away). Angouleme: (40 km) Attractive Roman city with its two major events: The Circuit des Remparts - Classic racing cars thrashing round the ancient streets, in September. The annual Festival de la Bande Dessinée takes place around January and focuses on the comic strips for which France is justly famous. Cognac (1 hr) is the centre of the industry of the same name, where you can enjoy cognac-tasting or just walk around this calm little town (with further sights). Boating on the Charente river. Nearest base is Jarnac (1 hr), English-style houseboats for hire. The annual Cognac blues festival takes place in July. Charente Maritime coast. La Rochelle, Royan, (each 2 Hrs) and the islands of Oleron & Re. Excellent beaches; wonderful sea food. A terrific day out. Lots of history. Numerous wildlife reserves along the coast. Charente Maritime is the centre of bird watching in France. Poitou-Charente is one of the culinary regions of France, with specialties such as duck confit and Pineau des Charentes. Local wines are good and very reasonably priced. Proximity to the coast means an excellent choice of seafood is always available, particularly in the colourful local markets. Biweekly markets in Ruffec (20 mins), La Rochefoucauld (25 mins) and several others within easy reach. At the last count there were 12 quite good restaurants within 30 minutes of the house. Significant Roman remains abound in the Charente area. Numerous 12th Century churches, including some splendid examples very close by. During WWII Les Augers was in the occupied coastal zone, but very close to the north south dividing line with Vichy. Ruffec was a key point on the evasion route for downed allied airmen, and the escape route for the survivors of the famous 1941 “Cockleshell Heroes” Commando raid on Bordeaux docks. Oradour Sur Glanne, site of the dreadful SS massacre of civilians in 1944 is approx. 1 hr away. Heating provided through modern storage heaters in each room. Limited internet available on request at small, additional charge. Separate lounge with predominantly UK channels, French doors towards the terrace and valley. Crockery/cutlery for 12. Full utensils. Large, fully equipped modern kitchen, with fridge/freezer, induction hob, oven, dish washer, two sinks. Breakfast bar. There is a separate dining room with an expandable table seating up to 10 people. In the kitchen, the breakfast bar will seat up to 4 people. iPod docking station in the lounge. There is a limited selection of board games in the lounge. The house is in a delightful setting and is very well equipped. We spent a very peaceful seven days here during a heatwave. The house's stone walls kept the house cool inside! Kristina was a most charming and discreet host and could not have been more helpful. Highly recommended. Nous avons été accueilli chaleureusement par les propriétaires qui se sont mis en quatre pour nous fournir des informations sur les randonnées et activités dans la région. Nous avons passé 2 semaines au calme et en parfaite harmonie avec la nature et nous nous sommes pratiquement trouvé né à nez un après-midi avec des biches qui ont été aussi surprises que nous. Maison bien équipée avec de beaux volumes. Merci à Nick et à Kathy pour leur disponibilité et pour la découverte du fameux Pineau des Charentes. C'était un plaisir de vous acceuillir et nous sommes très contentes de vous avoir pu introduire les activités et spécialités de la région. Merci pour votre visite! The house is located in a tiny hamlet, in close proximity to several small towns with a wide variety of activities and services. The area is known for 12th Century Romanesque architecture and Roman ruins, as well as deep chestnut (mainly) forests and sunflowers in summer. Charente is a culinary region known for its duck products, excellent seafood and of course cognac (Cognac is 57 km away). Several local markets offer regional produce.